As a budding sports journalist I am supposed to shed all my personal biases. It’s one of the key sayings in the business – No cheering in the press box. You stand for the anthem, you might clap if an injured played is able to rise to their feet, but that’s it. The reason behind this anti-fandom is obvious: we don’t want to betray any sort of favourite because the relationship between journalists and their audience relies heavily on the media remaining impartial. Readers need to know that our articles or reports aren’t filtered by any agendas. That said – I’m glad I’m not covering the Orlando Magic during the National Basketball Association playoffs because I sure am conflicted about them. Like most Torontonians, I have a deep-seeded loathing of Vince Carter. It runs deeper and longer than my career as a sports journalist, so it's difficult to shrug off. The animosity toward Carter stems from the 2004 season – his last with the Raptors – when there was a noticeable drop in his production on the court. He was traded to the New Jersey Nets that December for what amounted to spare parts, damaging the team for the next few years. In early January 2005, TNT's John Thompson asked Carter if he always played hard. As you can imagine, this flew as well as a lead balloon in Raptor-land. Now Carter is with the Orlando Magic, one of the three best teams in the NBA’s Eastern Conference, and playing against the over-matched Atlanta Hawks. Orlando is seemingly destined to move on to the next round of the post-season after beating the Hawks 112-98 on Thursday night to take a 2-0 series lead. Worse yet, there is a lot to like about the Magic. They’ve got a cast of young players that have an up-tempo style of play. Their success has lead to a nice rivalry with LeBron James’ Cleveland Cavaliers, a possible opponent in the Conference Final. Most basketball fans would agree that if the Cavs and Magic meet in the playoffs, as they did last season, it'd be one of the most exciting pairings of the post-season. In particular, centre Dwight Howard is one of the most charming players in the league. The reigning Defensive Player of the Year has thrilled at Slam Dunk competitions and always remains playful with interviewers and fans. He’s the kind of player that you want to see succeed. But his progress will drag Carter along, putting many Torontonians, myself included, in a difficult position. 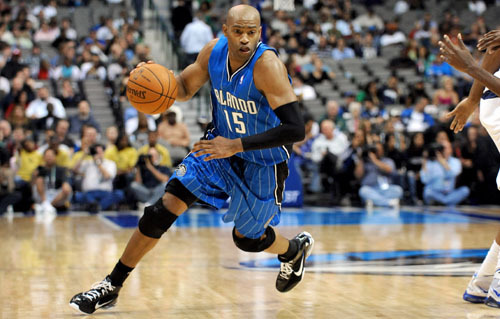 We want Howard and the Magic to thrive, but is it too late for Orlando to trade away Carter? Thank God I don’t have to report on this series. It’d be too hard to stay objective.